SAP HANA backup and recovery is used to perform HANA system backups and recovery of system in case of any database failure. It tells the status of currently running data backup and last successful data backup. 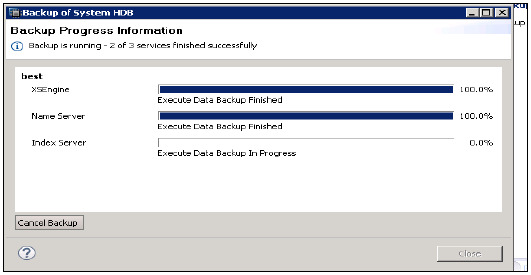 Backup now option can be used to run data backup wizard. It tells about the Backup interval settings, file based data backup settings and log based data backup setting. Backint settings give an option to use third party tool for data and log back up with configuration of backing agent. Configure the connection to a third-party backup tool by specifying a parameter file for the Backint agent. 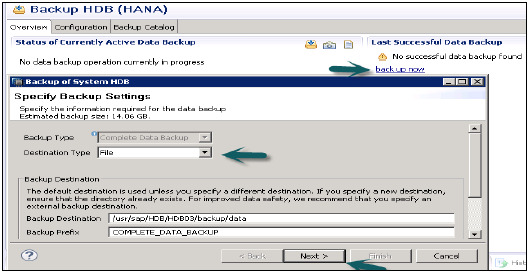 File based data backup setting tells the folder where you want to save the data backup on HANA system. You can change your backup folder. You can also limit the size of data backup files. If system data backup exceeds this set file size, it will split across the multiple files. Backint − is special named pipe exists on file system but require no disk space. You can choose backup interval from drop down. It tells the longest amount of time that can pass before a new log backup is written. Backup Interval: It can be in seconds, minutes or hours. Enable Automatic log backup option: It helps you to keep log area vacant. If you disable this log area will continue to fill and that can result database to hang. Open Backup Wizard − to run the backup of system. Backup wizard is used to specify backup settings. It tells the Backup type, destination Type, Backup Destination folder, Backup prefix, size of backup, etc. It runs the system backups and tells the time to complete backup for the each server. To recover SAP HANA database, the database needs to be shut down. Hence, during recovery, end users or SAP applications cannot access the database. A disk in the data area is unusable or disk in the log area is unusable. As a consequence of a logical error, the database needs to be reset to its state at a particular point in time. You want to create a copy of the database. How to recover a HANA system? Most Recent State − Used for recovering the database to the time as close as possible to the current time. For this recovery, the data backup and log backup have to be available since last data backup and log area are required to perform the above type recovery. Specific Data Backup − Used for recovering the database to a specified data backup. Specific data backup is required for the above type of recovery option. Specific Log Position − This recovery type is an advanced option that can be used in exceptional cases where a previous recovery failed. Note − To run recovery wizard you should have administrator privileges on HANA system.